Property management companies in Texas may be required to obtain a Real Estate Broker License. 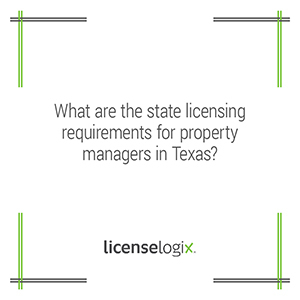 The primary functions of many property management companies, such as leasing, renting and collecting rent on behalf of others, are considered real estate activities under existing Texas real estate licensing laws. If a property management company is going to list, rent, negotiate the rental of property, collect rents, or place tenants on behalf of a landlord client in Texas, the business will need a real estate broker license. The entity must select a designated broker who is an officer, manager, or partner of the corporation, LLC, or partnership. The designated broker must be individually licensed as an active Texas real estate broker. If the designated broker does not own at least 10% of the entity, the entity must maintain E&O insurance in the amount of $1 million. Fingerprint submission by the designated broker of the entity. Completion of the Texas Application for Broker License by a Business Entity and payment of applicable registration fees. CLiC, your Client License Information Center, allows you to manage all of your business licenses, tax filings, and industry permits in one organized hub. LicenseLogix's new Renewal Confirmation service does the grunt work of following up with lethargic licensing departments to make sure your renewal applications are at the top of their lists. Let us handle your license filing process so you can focus on your core business. Our experts file thousands of business licenses a month on behalf or our clients - they are skilled and fast at filling out the right forms and know how to reach the licensing authorities in case of questions/concerns. To start the process of getting licensed in Texas, give us a call at (800) 292-0909.